"Supporters of the Torah: Be blessed by the Gadol HaTorah, at the time of the Giving of the Torah!" 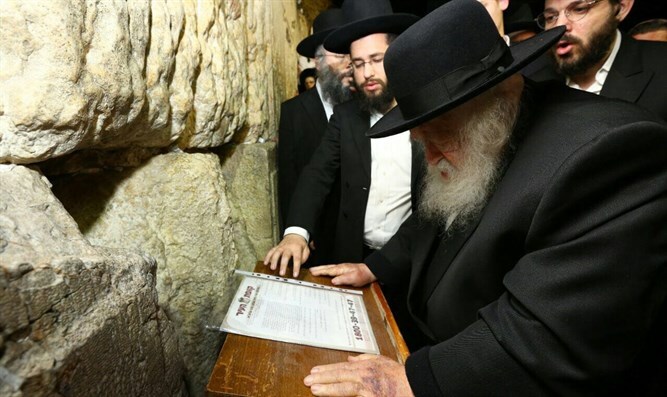 Rabbi Chaim Kanievsky, the distinguished Torah scholar, promised to pray for the health, success, zivug and parnassah of a select few when he is called up to the Torah on Shavuot morning. The group that will be prayed for are those who donate to Kupat Ha'Ir's Shavuot campaign. Donation will go directly to assist needy families of Torah scholars in Israel. Shavuot is almost upon us, and these families do not have enough funds to celebrate even a modest Yom Tov. They have turned to Kupat Ha’ir, under the auspices of Rav Kanievsky, shlit”a, as their last resort. Please, help them be able to enjoy the special Yom Tov of Shavuos. Names will be accepted for the next day only. During this special day, when we prepare ourselves to receive the Torah again, giving to this charity has special meaning and extraordinary effect. Apart from the tremendous merit of helping the families of Torah scholars celebrate the joy of Shavuos, Rav Chaim Kanievsky shlit"a, has promised that all donors will be included in his special blessing of the Mi Shebeirach when the Rav is called up to the Torah for the ultimate honor of reading of the Aseres Hadibros, the Ten Commandments.